As a writer and journalist, Graham Hancock has investigated some fascinating topics like the evidence for an ancient and very advanced lost civilisation, the Orion correlation theory, and the ‘War on Consciousness’ – a talk that was infamously banned by TED. 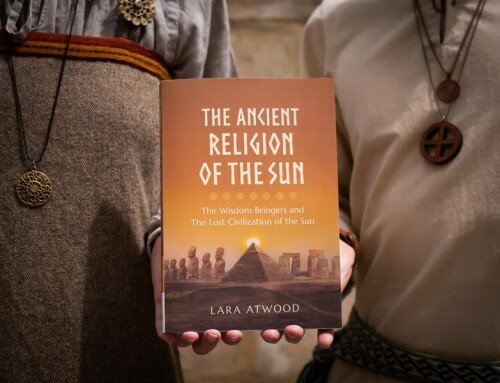 We’ve been particularly interested in his research on ancient sites and the significance of their alignments to celestial patterns, as the lost spiritual knowledge of ancient civilisations is something that we’re helping revive today through the work we publish. 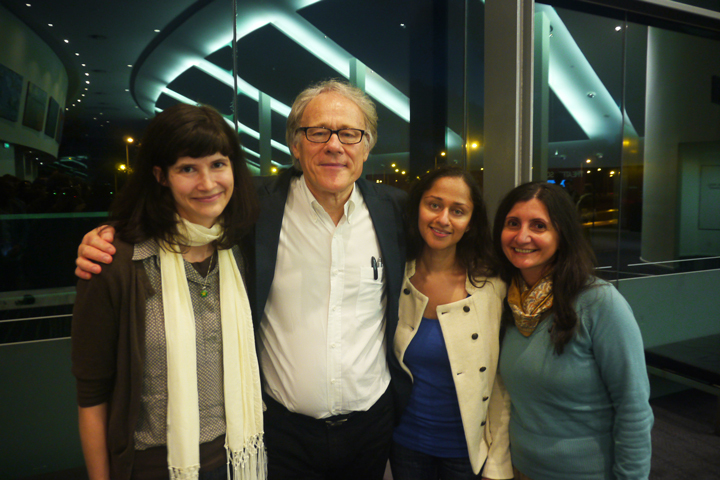 So we went along to see the ‘Magicians of the Gods’ book tour that he undertook to promote his latest book. Having seen some of Graham Hancock’s talks and documentaries online, I was pretty excited to attend this in person. Arriving at the venue, people of all ages and walks of life were buzzing around, from dreadlocked youth to distinguished types and everyone in between (like us!). The venue capacity was adjusted to accommodate 1030 people and from what I could see, it was mostly full. The day-long presentation started with Graham reading from a hermetic Egyptian text that makes reference to an ‘ark’, and this began his first presentation on the Ark of the Covenant. 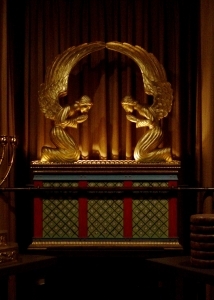 Graham described how the Ark of the Covenant, best known for its importance in the Old Testament as containing the stone upon which was inscribed the Ten Commandments and the reason for building Solomon’s Temple, was also worshipped by the ancient Egyptians and referenced in their texts. He discussed how the Ark was used in the Old Testament for destruction and war, citing its role in bringing down the walls of Jericho, and the destruction it wreaked upon the Philistines after they stole it. Graham contrasted this to the references to the Ark in ancient Egypt, where it was always a sacred object and never used as a weapon of war. 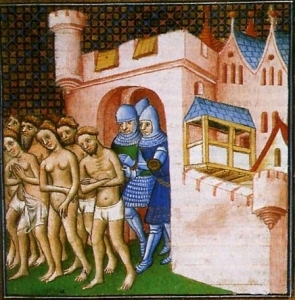 He put forward an intriguing notion that the Ark of the Covenant had parallels to the Holy Grail, and described how the quest to find the Ark was similar to the quest for the Holy Grail, and how the Knights Templar (in their quest for the Holy Grail) occupied and guarded the site of Solomon’s Temple in the 12th century. Having followed references to the Ark in literature and ancient texts, Graham put forward the idea that the Ark is a physical object with a certain type of nuclear capability, like a nuclear weapon. He also related his research as a foreign correspondent in East Africa during the 1980’s and his interactions with a Christian Orthodox church there, which led him to conclude that the Ark is currently located in Axum, Ethiopia, and worshipped and guarded by an Ethiopian Christian sect there. The research and investigations that Graham has done into the Ark and the Holy Grail is quite impressive and I think the parallels he has drawn between the Ark and Holy Grail are worth considering. 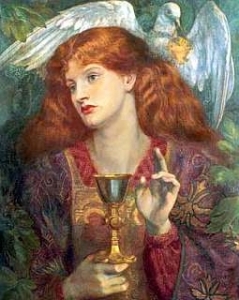 However, I found that while Graham focussed upon the physical evidence for the Ark and the Holy Grail, there is another consideration which is perhaps even more relevant – the fact that both the Ark and the Holy Grail are symbolic representations of a sacred spiritual knowledge which has been searched for, guarded, and protected by spiritual and esoteric groups through the ages. Spiritual knowledge, quests, and teachings were often coded and cloaked in symbology to protect it through the ages from those who would be hostile and seek to oppress it. 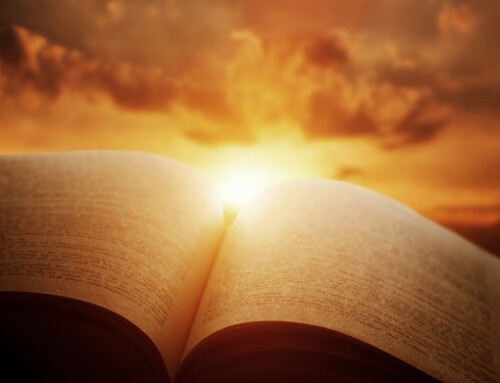 Mystics and spiritual seekers understood that the relevance of certain objects in texts and stories actually had a symbolic spiritual meaning that transcended its physical representation, and were able to extract wisdom and spiritual insight through a deeper comprehension. 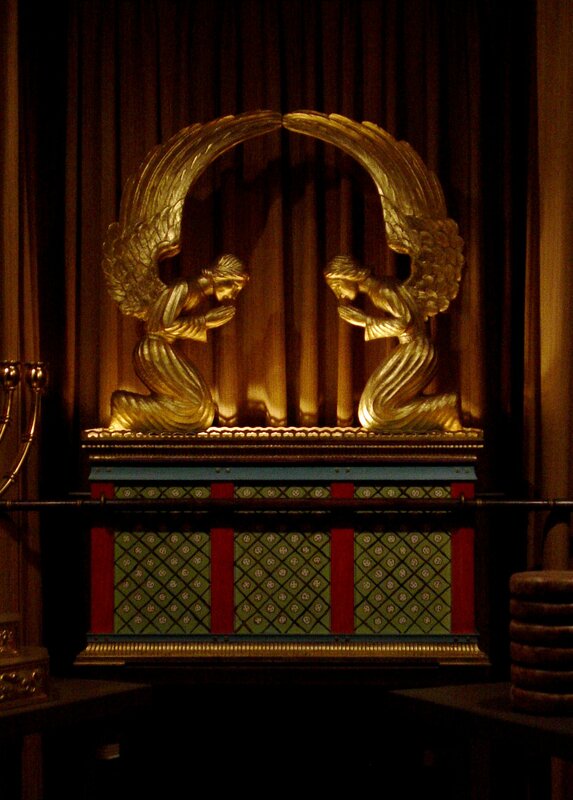 Both the Ark of the Covenant and the Holy Grail have a symbolic meaning which has been passed down through the ages – they are metaphysical symbols of salvation referencing the Alchemical work. Both these symbols have been used to represent Alchemy and the inner transformation of a person’s energies through sexual alchemy. The quest to find the Ark and the Holy Grail, is in fact the quest of an individual seeking enlightenment, and the sacred Ark and Grail represent the sacred practice of Alchemy needed to achieve salvation. The power of both the Ark and the Holy Grail refers to the ways that the sexual energies can be transformed either for divine (angelic) and sacred purposes, or for evil (demonic) and destructive purposes. 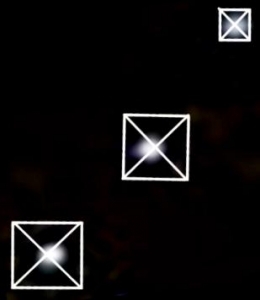 Hence, the representations of the Ark and the Holy Grail do appear throughout ancient scriptures and legends as a metaphor and symbol of the spiritual work as the process of enlightenment is universal, so that’s why we see common symbols appearing throughout different cultures and traditions. 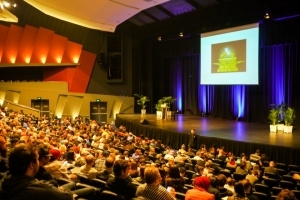 After a presentation on the research behind his fictional book ‘War Gods’, Graham presented what is perhaps his most well-known talk on the ‘War on Consciousness’, which caused controversy and was banned by TED due to his advocacy of the psychedelic plant Ayahuasca to experience altered states of consciousness. The talk began with another reading from an ancient Egyptian text, this time from the Egyptian Book of the Dead, called ‘Awakening Osiris’; an amazing and powerful piece. Graham pointed out the limitations that materialist science has with explaining and understanding consciousness, giving the example that things like visions are discounted as changes in brain chemistry, which disregards phenomena like past-life memories or out-of-body experiences where verifiable information is produced by someone without any rational explanation. He spoke briefly of the research of Ian Stevenson about past-life memories from children under 7 years of age, and also relayed his own near-death experience at age 17, when he was electrocuted and found himself floating up and seeing his body below. Interestingly, this near-death experience inspired him upon his path to search for and understand the nature of consciousness – something which I and many others can relate to as when I had my first out-of-body experience (not as a result of a near-death experience but through astral travel) it also spurred me to explore consciousness further. Graham summed it up by stating that materialist scientists do not have answers to death; however ancient civilisations like Egypt enquired into it extensively, which warrants consideration into their knowledge of life and death. Graham explained the ancient Egyptian view of life as an opportunity to learn and correct mistakes, and their belief in reincarnation until a person has become perfected. He described the ancient depictions of the judgement of the soul that can be found in Egyptian art, showing the heart (representing the soul) being weighed against a feather (representing truth, love and goodness) on a set of scales. Good deeds and correcting mistakes could tip the scales in your favour, and people were given many lives as a means to correct mistakes and learn. However, ancient Egyptian culture was all but destroyed after the Emperor Constantine became a Christian, and the spiritual knowledge that the ancient Egyptians were custodians of was driven underground and hidden. He spoke about the ancient texts found buried in a cave in Egypt known as the Nag Hammadi Library, and the Pistis Sophia, which describe the spiritual knowledge of the Gnostics, an early Christian sect that promoted the view that the individual had a divine spark within and could attain salvation directly without an intermediary. He described the Gnostics as a “fatal bullet to the 3 major religions” of Judaism, Christianity, and Islam, as they avowed liberation as a personal spiritual work and had no need for a hierarchical religious order. The Gnostics were subsequently persecuted, along with the Cathars in France who also shared Gnostic beliefs, and they were wiped out. Because the Gnostics no longer exist and their teachings are obscure to us today, Graham posited that in order for an individual to gain spiritual knowledge and expand consciousness today, psychedelics such as Ayahuasca used by Shamans can be employed to provide consciousness-altering states and gain spiritual insight. This is based upon his own personal experiences in taking Ayahuasca and the insights he gained as a result, which included an experience with a ‘Mother Goddess’ figure who showed him the destructive nature of his cannabis use. This experience spurred him to quit his long-standing addiction. This talk concluded with Graham making the observations that the freedom and sovereignty over our consciousness is a human right, and the war on drugs infringes this right. The points that Graham made about the woeful inadequacy of materialist science to explain death, and the value of the teachings of ancient civilisations like Egypt to understand death resonated deeply with me, as this too is what I’ve found from years of spiritual practice and study, and is also reflected in the works we publish. I believe we can go one step further however, and gain personal and direct knowledge of what happens with death through out-of-body experiences, and uncover the same spiritual knowledge of life and death that ancient civilisations sought. I don’t think it’s any coincidence that a near-death experience was a defining moment from Graham Hancock, as out-of-body experiences provide a whole new perspective to the nature of our existence and a radically different and profound way of gaining knowledge compared to conventional intellectual research and study. 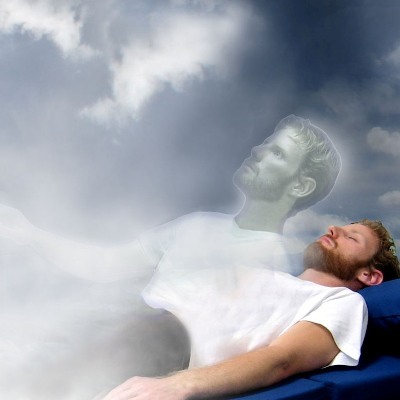 We don’t need to just study the relics left behind by ancient spiritual civilisations to learn their wisdom of life and death – we can find out for ourselves by using practices for astral projection. The links Graham made to the spiritual wisdom passed down through the ages from groups like the Gnostics and Cathars was also surprisingly synchronistic as I’ve personally been involved with the study of Gnosticism. I was reminded of the Secret Quest series which also drew together the commonalities of the esoteric traditions of groups like the Gnostics, the Cathars, and the Knights Templar, based upon the research of people who were practising a modern form of Gnosticism, which just goes to show how researchers with different approaches can reach similar conclusions about the sacred teachings and groups of the past. One point of difference would be my approach to experiencing consciousness and spirituality today. I agree that today there is a war on consciousness, however I believe it is a broader thing affecting our ability to naturally gather, explore, and experience consciousness. This is where the real suppression of consciousness is, in the way that we’re marginalised, attacked, or censored from gathering and speaking about consciousness openly. I don’t feel that we need to rely on any kind of drugs to do this, or any external aids for that matter, as the same latent abilities that existed within the Gnostics and mystics of the past exist within us today. The same yearning for oneness with divinity that saw the ancient Egyptians dedicate their society to spiritual knowledge burns within us today, and I feel that if we want to explore and expand our consciousness and advance spiritually, we can use the same spiritual practices and techniques that have been used throughout time. Our ancient sacred past need only be obscure if we have no interest in rediscovering it, but we can activate consciousness in our lives and create the environment for the sacred knowledge of the past to once again flourish, if we want. Graham’s final talk was the one that we were undoubtedly most looking forward to, where he presented his research showing the alignment of ancient sites to constellations and astronomical occurrences such as precession, which suggests that sites like the pyramids of Giza and Angkor Wat are actually far older than historians and archaeologists give credit for. 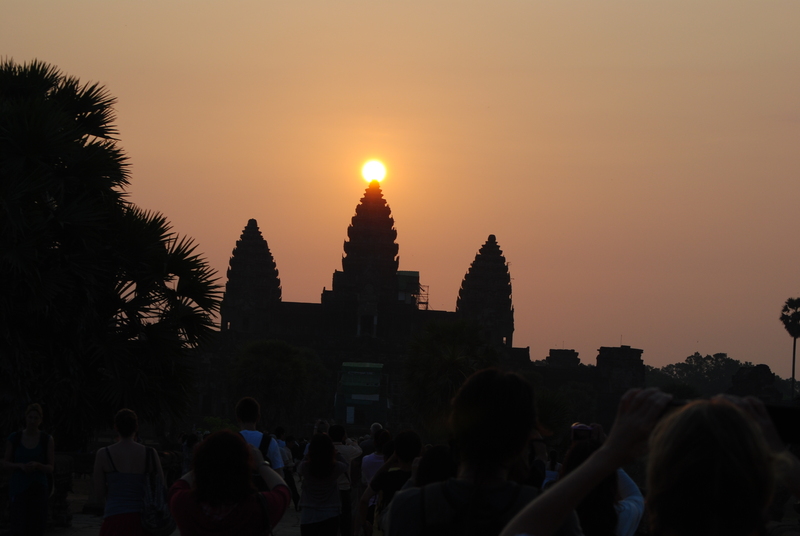 Both the pyramids and Angkor Wat align perfectly to the constellations of Orion and Draco respectively as they would have appeared in the night sky 10,500 years ago. Other points about the precise dimensions and construction of these sites shows that the people who built these sites not only had an extraordinarily high degree of knowledge of engineering, astronomy, masonry, and spirituality, but they had a shared knowledge that indicates they were connected in some way. Given that conventional history suggests our current civilisation only began to emerge from the Neolithic period between 10,000 and 3000 BCE, and that we only started sailing the oceans around 9000 years ago, the concept that older and apparently more advanced civilisations that had already made contact with each other could exist, flies in the face of conventional wisdom. Other evidence suggesting that a much more ancient and advanced civilisation existed included the discovery of the Indus Valley civilisation, encompassing a huge area including most of modern-day Pakistan, and parts of India, Afghanistan, and Iran. Known as the Harappan civilisation, the major cities of Mohenjo-Daro and Harappa have been only partially excavated and date to as far back as 7500 BCE, showing a highly advanced and organised urban city of up to 5 million, complete with running water and flushing toilets to each household. It is thought to have been the largest city in the world of its time, and sadly but ironically shows a much higher standard of living for the inhabitants of its time than for many living in the cities there today. There is also a huge amount of intriguing information underneath the waters off India and Japan on the ocean floor, which show sophisticated man-made structures that are older than 10,000 years old. These structures would have been built when the lands were above water, before the end of the last ice age. However, the reluctance of authorities to challenge the conventional wisdom of historians and archaeologists has meant that little interest and research has been done to discover more about these sites, apart from a handful of dedicated people who are working outside the establishment. Having travelled to many ancient sites himself and undertaken research, Graham pointed out that the older the sites were, the more advanced and sophisticated they were. The sites that are older than 10,000 years show a greater level of skill in astronomy, engineering and so on than younger sites built 5000 or 1000 years ago. He suggested that this is evidence of an ancient lost civilisation that could have existed as far back as 12,000 years ago, such as the fabled Atlantis, which was then wiped out and the surviving inhabitants across the world sought to build sacred sites that contained their spiritual wisdom and knowledge for the future. This would explain why the most impressive sites appear to date to 10,500, as through the passage of time, society’s spiritual understanding degenerated as did its architecture. It is with some arrogance that today we believe we are at the apex of our civilisation with advanced technological capabilities, and that the people of the past were primitive and ignorant ‘noble savages’, when the reverse seems true – we have lost the knowledge and technology that allowed such wonders as the pyramids to be built. Graham concluded the talk with a parting reflection on the resilience of the developed world compared to the majority of the world living in poverty, asking who would be most affected if another catastrophe engulfed the earth and wiped out populations – would the first world, so reliant on comforts and technology prevail to create a new society, or would it be the poor who have learned how to live and survive with little? Interesting food for thought, and got me considering humanity’s dilemma not only on a physical level, but a spiritual level too. What sacred knowledge would be our legacy? 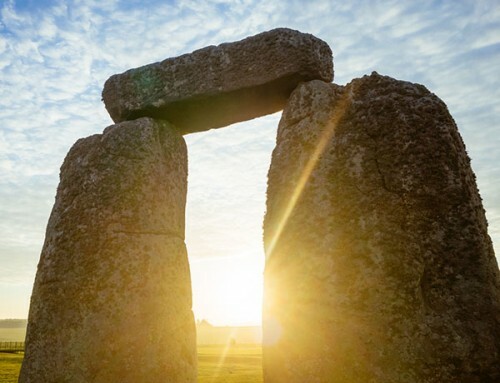 What have we created today that could inspire and spiritually connect with peoples of the future, the way that places like Stonehenge or Chichen Itza can today connect us to our ancient forefathers of the past? What could we point to, apart from something like the Eiffel tower or the Empire State building? What would that communicate about us to our descendants in one or two thousand years? I believe that gaining an understanding and appreciation of these ancient megalithic sites is an important first step, but also that we should not leave them as a thing of admiration, locked in the past, merely something to be visited on a once-in-a-lifetime trip with evidence we were there posted on Facebook. I believe the ability to have a spiritual understanding and relationship with the cosmos and to create sacred sites is latent within us now, and is our birthright as human beings. We can create a new golden age by unlocking the power of our consciousness and gain access to the same knowledge of the collective past that stirred within the hearts of the people who built sacred sites like the pyramids. We can unlock the keys of history and sacred spirituality within our own lives, using the same ancient mystical practices and ceremonies used for thousands of years, and create sacred places of our own today that enliven our consciousness and nurture our spiritual journeys. Spirituality has been my passion for the last 12 years. 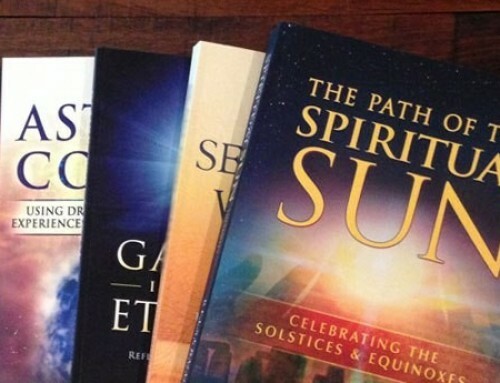 My role in Mystical Life Publications includes managing copyright, contracts, and company files. Hi Priya, this article you wrote, may have been 4 years ago, but it’s content relates today still, not only from the viewpoint of rediscovering what ancient civilizations knew (and has gradually become lost) but also from the standpoint of how new evidence, and research is unfolding to reveal a different human history. 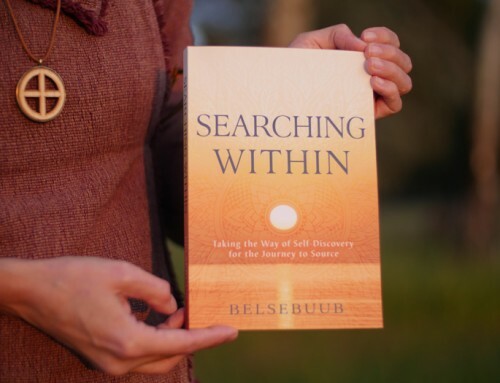 The books and information available on Belsebuub’s website, on Sakro Sawel, The Path of the Spiritual Sun, all reveal the same theme – that civilization has existed far longer than conventional or mainstream experts wish to acknowledge. It is both refreshing and liberating to see a different version of human history emerging ever stronger – one that has spirituality as a focus rather than materialism. I think more is yet to be revealed and it is a massive project for Belsebuub and Lara, as well as others who are supporting those projects. This includes archeologists, geologists, etc who are discovering more and more ancient and advanced sites built by a lost humanity/civilization. I’m exploring Graham Hancocks’ work and I’m amazed by his findings and the open-minded approach he has. Going against mainstream archaeologists and stereotypes is not an easy thing but surprisingly, the discovery of the Göbekli Tepe was a shock for academics and a kind of reward for Hancock and others. There are still a lot of mysteries around those findings and conspiracy theories easily are coming up but I can’t hold to say about the possibility of a chamber under the great sphinx which once was detected the authorities didn’t allow any further investigation. As you said I feel also our generation’s responsibility is also to make and leave something for the next generations, something beyond time and which follows universal principles. I wish we make it! Graham Hancock is having a live seminar in Legian Bali, the location is quite near to my brother’s restaurant, it’s a shame I’m not visiting :). The event is being held tomorrow at The Potatohead Beach Club and the topic is on a 20,000 year old pyramid located in Java Indonesia which is very close to Bali. Sounds very interesting. Below is Graham Hancock’s facebook link with additional information and an excerpt on the details. “Recovering Earth’s Lost Civilization and Reawakening to Consciousness. You make some really interesting points Clifford. I can see how important this information can be in realising a forgotten, or perhaps a hidden, past. Truth, amongst so much misinformation ideas and beliefs that is out there now, is hard for people to discern, which is why for me, the practical use and experience of spirituality is what helps me to discern fact from fiction and authentic from illusionary. Excellent piece. Would have been amazing to have gone to hear Graham Hancock. While I value many new thinkers who bring back the ancient past and who courageously expose controversial topics that many are afraid to touch, there is still somewhat a lack of depth to lots of paramount concepts – which in some way categorize many of these ”new approaches” right back into the limitations of modern science. ie. The Ark and the Quest for the Holy Grail. Where one only cares about physical proof, ignoring the greater scope of spiritual search that existed on the planet where people actually lived out these quests on personal levels and have written about the symbolism behind it. If someone really seeks out after his/her yearning, and are persistent with it, I think anything obscured will in time be understood. Albeit with a little bit of hard work and addressing this great magnitude of our existence and the purpose of our consciousness. Thanks for this wonderful article Priya. What a great opportunity to hear Graham Hancock and thanks for passing this information on. I find it quite ‘interesting’ that we think we are so advanced today, when we really can’t even work out how the Pyramids were built :o). Sadly there is so much that has been lost. Today’s religions seem to have little to compare with the spirituality and connectedness of ancient civilizations. An inspiring article to develop our consciousness and “create sacred places of our own”. I would give literally anything to have a conversation with Graham Hancock. Lucky you for getting to go! Sounds like a great event. I’m always blown away by how places like Adam’s Bridge, Harappa, Mohenjo Daro, etc., and their origins are hardly ever mentioned for the marvelous and mysterious places that they are. Their existence alone tells us of an intelligent and sophisticated ancient past, and it’s a clear indicator of how off modern history/archaeology is. Yet, hardly anyone takes interest. Your conclusion is a very important reflection as well. 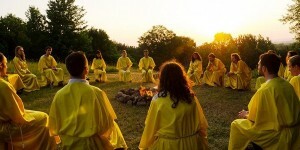 What do we as a society have to offer future civilizations by way of passing on the spiritual? Thanx Graham you have opened my mind in many ways for which I’m greatfull but in the light of the article of Priya I must ask some questions: 1) Why is spirituality higher or more advanced than for instance scientific thought? 2) Is there any instance where spirituality led to the discovery of science or technology that could have led to the building of such structures as the great pyramids? Or the stones at Baalbeck? 3) Why do people think that when they are spiritual or have isoteric knowledge that they have better knowledge than what the scientists have? 4) I believe the old people might have had better “science” or technology than us or I’d rather say different than us at this stage. But should we arrive at the conclusion that they were more spiritual than us? 5) What if the world would drown again and people 10 000 yr. from now would discover the Hadron collider at Cern, what would they think of our gods or graves or spirituality? A lot remains to be done. But thanx Graham for bringing it to the people. I’m looking forward to the sequel of figerprints of the gods. It really dawned on me how ridiculous it is to believe that we could be at the apex of our civilization. The ancient civilizations and structures and spiritual aims were remarkable. Looking around at the ancient structures alone, it seems almost impossible to not realize there is something seriously lacking in our current state of humanity. Thanks for putting this great review together. I really appreciate your fervent appeal for us to come to the levels of our consciousness to re-create all things and thoughts. I agree that we, as US citizens need to fight for our right to reach the highest levels of our conscious minds. I don’t even want to use the word mind, there. It is beyond words. Team up with the Dead Heads, Further followers, Dark Star Orchestra fans, there is your new world of consciousness, with love and love, again. Sounds like a really interesting event Priya, thanks for sharing about it! One thing that stood out to me was what you mentioned about the modern world somewhat arrogantly thinking we are at the height of civilisation but it seems like that’s not the case. We might have lots of technological advancements but we’ve really gone backwards it seems in terms of spiritual development and we don’t really know what we’ve lost because it’s become so obscure. I would have loved to attend that presentation. Very interesting topics. I was especially interested in what he said about civilizations of the long forgotten past. I am personally very inspired by ancient sacred sites and how building places that involve sacred geometry and alignments can become a very interesting learning process and a spiritual boost for the people involved. After recently finding out about Graham Hancock’s talks from MLP on the Belsebuub site, I must confess that I was disappointed to have missed such a great opportunity. Thankfully after reading your article the disappointment was totally gone. Great post, and I have passed it on to others who are searching. Priya that’s a great account of the talks given by Graham Hancock, and I really appreciate the insight and disposition you’ve shared on the spiritual significance of those discoveries for people today. Excellent overview and a great presentation by Graham! Thank you Priya for such an insightful post. There is a lot in there that I could relate as my own journey mirrors yours. This was fascinating to hear about is NDE as well as his experience with the Mother Goddess.. But one point that really got me was on your reflection of our legacy. It really struck a chord, as it is something I reflect upon quite often but on a personal level. If I died today, what would my legacy be. That bit stuck out at me too Geraldine, got me thinking about whether we should bury some of MLPs books for future discovery! I really admire Graham Hancock’s work. He’s been to so many amazing sites around the world, like the top of the Great Pyramid in Giza (five times? ), to Göbekli Tepe in Turkey (which in itself turns back the clock on the supposed origins of civilisation). I hope he keeps uncovering more mysteries about these sites and many others. I do however disagree about the use of Ayahuasca or any other psychedelic substance in order to advance spiritually. From my experience psychedelic use is no match for experiences gained through efforts with self-knowledge and astral projection. The quality and outcomes are completely different. Unfortunately, I think many people not knowing the difference may take psychedelics thinking they are the only means to experience higher things.